After much reassurance that our new friend was a trustworthy chaperon to lead us on our musical outing, Aiwa the President of the Human Rights Association we were staying with finally agreed, ‘ok, you may go, but you must be back by 11 pm’. It was already 9 pm and feeling rather limited by the mothering Imran replied quite perfectly, ‘Inshallah‘. Aiwa flashed a grin in our direction and nodded. 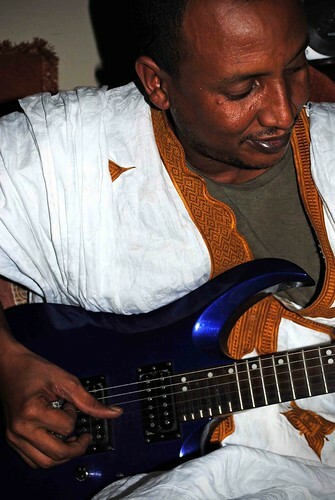 Armed with a guitar, camera and sound recorder we made our way through the dusty cratered streets of Nouakchott to the house of a family we had been told were great traditional Mauritanian musicians. 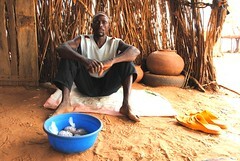 Jeick Ould Chighaly welcomed us with warmth as we entered the busy household. 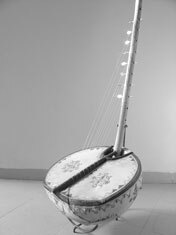 Scattered around the generous sitting room were instruments of Mauritania. Jeick approached us with his electric guitar. ‘It as a quarter-tone guitar’ he casually exclaimed. Imrans eyes lit up as he cradled the guitar in his arms and explored each fret, twice as many as on a standard guitar. Jeick watched content at the shared enthusiasm. With so many notes at his disposition, Jeick’s playing style is somewhere between the desert blues of Ali Farka Touré and a proficient oud player. After playing the electric guitar he then demonstrated his agility on the tidinit, a Mauritanian lute almost identical to the ngoni. 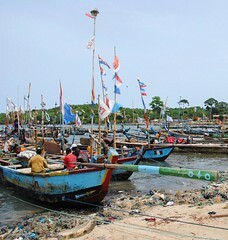 We sat mesmarised by the improvised lines that could rival Bassekou Kouyaté‘s. As Jeick played to us his intimate audience Noura his wife and fellow musician joined us. With little more than a brief salam Noura picked up the ardine and began to brush across its strings with eloquent skill. As she played we sat in awe of the beautiful harp-like sound. 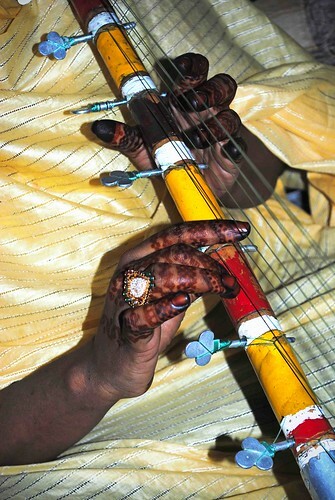 The ardine is a 20-string harp with similar ancestry to the Kora. Unlike its Mande cousin, the ardine is played exclusively by women. 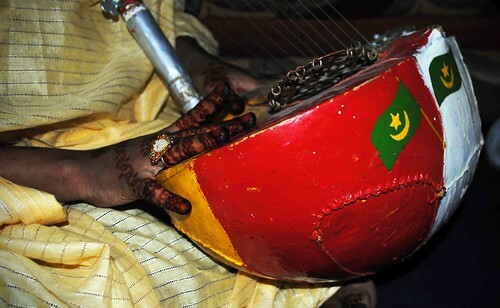 In the region of West Africa where instrumentation is dominated by men, this female tradition is unique to Mauritania. ‘On my album, I have traditional songs that are recorded as reggae pieces with drums, bass and saxophone’, she says with a smile. But there is little talking, soon it is our turn to play. As we finish sipping our tea we play my song ‘Wine Merchant‘. There is no discussion of who we are, our cultures or traditions, yet a sense of musical connection hold on to us for the a couple of hours before Imran and I are forced to leave for our 11 pm curfew. Noura invites us to form some kind of music project together, presumably blending our styles, Imran and I are instant to accept. We are forced to explain our visa situation, expecting this to be a major problem but Noura simply tells us to come back or they will meet with us in Mali. Relaxed to feel a natural sense of this only being the first meeting we would share we said our goodbyes, but not before I was welcomed to play the Ardine and presented with a gift of a stunning Mulafa (the traditional dress of the Moor women in Mauritania). Cross-legged I clumsily plucked at the strings without a trace of the beauty and grace that Noura had displayed. Jeick sat with me and in the last moment of the evening we played the traditional song ‘Wading Deep Water’ with Jeick accompany on tidinit. We parted leaving Jeick and his beautiful wife, Noura the Diva of the Sahel in Mauritania, the country we were only just beginning to discover. UPDATE: since we wrote this blog Noura Mint Seymali has released a new CD (September 2013)! 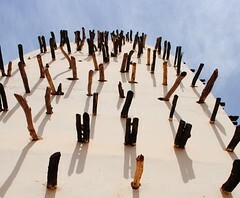 With the advice of the gimbri carver we met in the park yesterday we take a bus towards the Kasbah of the Udayas expecting to hear some gnawa music in a concert like venue. 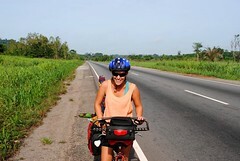 Using the Moroccan GPS we make our way towards what tranpired to be a private address in an old part of the city. As we grow closer to te house the location of the music we were looking for becomes very clear. The rhytmic crash of the krakebs hits the night air and stops us in our tracks, this was unmistakable sound of Gnawa music. We take timid steps closer to the house where we are spotted looking intrigued and are swept into the house through a large timber door. The building, an old riad style house has an open terrace carpetted with traditional rugs and littered with Moroccan antiques. The walls tell the stories of history, swords and daggers, gold leaf paintings with pensive looking warrior characters. The terrace is cushioned with satin pillows and low laying intricately carved tables. In the welcoming palm of each table and cushion sit ornate silver teapots, the smell of their sweet mint tea filling the air. The intoxicating sound of the Gnawa music is encaptivating and as we stare around the room in awe of the scene sorrounding us it felt as though we might be beautifully invisible. No one is stirred by our unusual presence. We are not questioned as to why we have come. Each individual seems caught in their own moment, the hypnotic rhythm of the krakebs and the soulful tone of the gimbri. 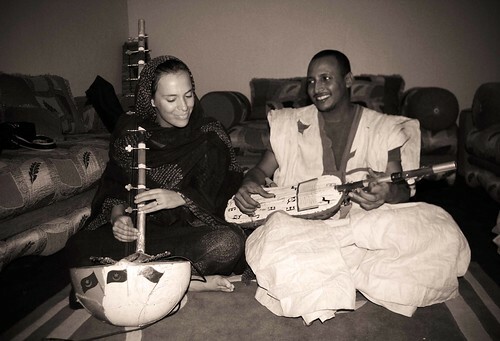 Gnawa music is ancient in its origins, and there are intertwining influences between West African music and the Gnawa tones. 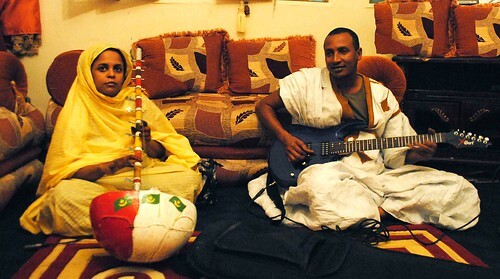 Descendents of Sub-Saharan slaves the Gnawa are well known for their traditions of trance like music. The krakebs have an intoxicating effect on the mind, and it’s easy to see how it can induce a trance state. The empowering volume alone is impressive, but it’s the rhythm that tricks the mind. Rhythms are either a loose 4/4 comparable to samba, or a 2 against 3 feel. 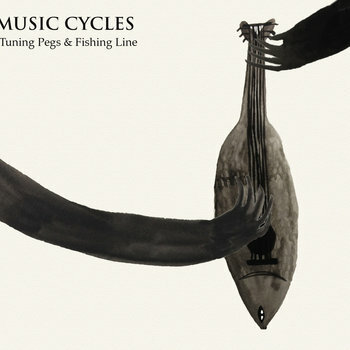 Short in cycle, you subconsciously hear a different rhythm each time. A break arrives in the music and we are invited to sit with the musicians who are keen to tell us more about their culture. The gimbri player, Sadiki sits next to us and prepares his hashish/tobacco mixture before puffing gracefully at a long wooden pipe. Next to him the three krakeb players sip their mint tea quietly and listen to th conversation nodding in agreement at intervals. The break is over and they return to sit and play. Many moments seem to have passed us but we are unaware of how long we have been sat for. Slowly, one by one, the people around us crawl towards the musicians. In trance they move to the rhytyms, shaking their heads, crying and swaying from side to side vigourously. The women who work and live in the house cover them in silk scarves of seven different colours (representing the seven different spirits) and for every person who joins more incense is added to the smoking embers. The music seems to reach a climax but then draws back again before entering a series of prayers, then another series of songs are played. Finally, as each participant calms and their movements simmer the music so too follows, more prayers are said and a break is taken. The musicians again join us for tea, this time they are grinning in our direction as they humourously stretch out their hands and fingers, they have been playing now for some 45 minutes continuously.